Last week I thought spring had finally sprung: The weather was gorgeous, trees and flowers were blooming...then it snowed this weekend! Bah! All is not lost, however. During the few sunny days we were graced with, the hubs and I started making plans for a raised bed vegetable garden in the backyard. From there my mind drifted to getting something to carry and store our tools, then getting something to gather our (hopefully) glorious veggies. And in both scenarios I knew we already had the perfect thing: a gathering basket I bought in the Lodwar market in Kenya. 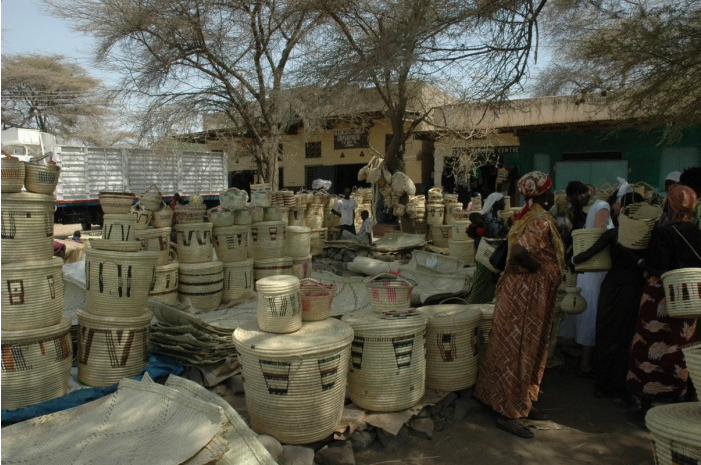 This beautiful handmade basket is also extremely sturdy because basket-weaving is one of the things for which the Turkana people are known, and one of two things their region depends on for revenue (the other being tourism, which doesn't happen much since the area is very dry and drought-stricken). They could fetch a fair price for them in markets in Nairobi, but since they can't afford to make the trip, buyers come from the capital, get them for dirt cheap, and then resell them to tourists for three times what they paid. So, as I use this basket in the coming months, I will remember our beautiful friends there, especially Agnes and Sara, who helped us navigate that crazy market (see photo below). And I will hope that some day soon their art can be appreciated and available to more people.